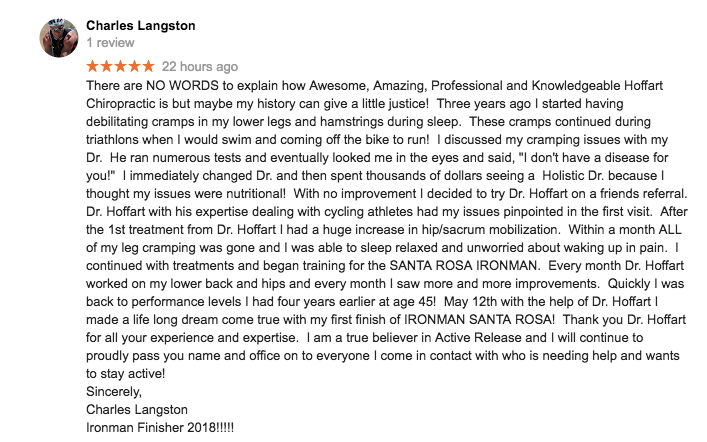 At Hoffart Chiropractic we love when patients share with us their feedback and comments after chiropractic care. Please read our patient testimonials below to see what other people have achieved through their tailored treatment plans with us. Share your stories too! Click here to send us your feedback so that we can help to spread the word about the benefits of natural Hoffart Chiropractic care. “The staff are extremely knowledgeable and friendly! From the moment I walked in the office I felt comfortable with the team. Dr Hoffart went over and beyond to take the time to go over in detail anatomy and things that other chiropractors failed to mention. Dr Hoffart has explained to me my treatment plan and his goal and that my ailments are not an overnight fix, but he is up for the challenge! “I am very glad Dr Hoffart does this very unique procedure, I have very extensive medical conditions and he is the Best practitioner for my needs. I was in a lot of pain and had a neurosurgery 2 months prior.I walked in his office with leg spams and difficulty walking and in a lot of pain. He has strengthen my back, leg and hip muscles with the atlas orthogonal treatment. I was able to walk much better after the 1 st treatment, and have continued to get better everyday since. My general pain is reduced , I eat and sleep better I have a long way to go but I feel so blessed to have found Dr. Hoffart , I also have other family members that are seeing him for other conditions.